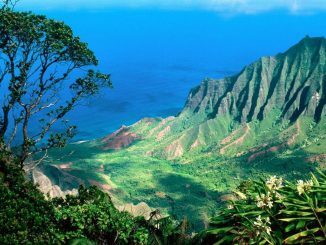 Medical cannabis has been legal in Hawai‘i since 2000, but people had to grow their own or buy it on the black market. Federal law has, since the 1930s, effectively outlawed marijuana and in 1970 classified marijuana as a Schedule 1 controlled substance of no acceptable medical use. It is still a felony to grow, possess and sell it. It is also illegal to transport it over federally controlled waters or through federally controlled airspace. A recent change to federal law, which came into effect on January 1, 2019, as a result of the 2018 Farm Bill, removes cannabis with very low tetrahydrocannabinol (THC) counts from Schedule 1, but the threshold (containing less than 0.3 percent THC in dry weight) is, in effect, only high enough to have removed hemp from the schedule. The 2014 Farm Bill had made state-regulated hemp-growing pilot programs legal, but the removal of all constraints is a particular boon to states that used to grow tobacco and other crops whose value has diminished dramatically over the years. 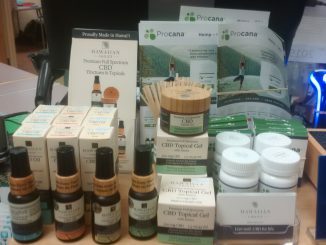 Hemp is high in cannabidiol (CBD), and products containing CBD – such as supplements and lotions and creams to relieve aches and pains – have been available over the counter at regular pharmacies nationwide for some time. THC is the psychoactive substance in cannabis that gets you high; CBD is more likely to give you a mellow buzz. A combination of the two, with THC in low concentrations, can reduce spasms, mitigate depression and anxiety, or dull pain, which is why medical cannabis can be legally prescribed in Hawai‘i to patients with, for example, multiple sclerosis, epilepsy, PTSD or rheumatoid arthritis. Some strains reduce pressure in the eye, so glaucoma is another qualifying condition and several certifying doctors are eye specialists. Hawaii Revised Statutes (HRS) 329 (Uniform Controlled Substances Act) is the law that was amended to permit and regulate the growth, sale and use of medical cannabis in the state. 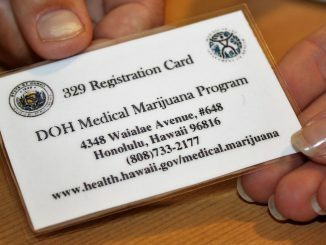 The card issued by the state Department of Health (DOH) to medical cannabis patients is known colloquially as the 329 Card and allows the carrier to grow 10 plants (with low enough THC content to qualify as medical cannabis) out of public view on the property where they live, and to be in possession of four ounces of usable cannabis at any time. The law also established the criteria for commercial operations (dispensaries), which must grow and process the cannabis themselves, have it tested by a state-sanctioned laboratory, and sell only their own products to those with a 329 card (seed-to-sale). In 2015, the DOH was authorised to issue eight licenses: three on O‘ahu, two each on the Big Island and Maui, and one on Kaua‘i. Each licensee would be allowed to operate up to two production centers and two retail-dispensing locations. The application process (there were 59 applicants) ran from January 12-29, 2016, and the department announced its merit-based selection on April 29 that same year. The licenses allow medical cannabis dispensaries to acquire and grow marijuana seeds, clones and plants. By law, the approved dispensaries were permitted to begin retail operations in July that year, but the first two dispensary operations to be issued Notices to Proceed to Acquire and Cultivate Marijuana didn’t receive them until February, 2017, and delays in selecting a laboratory that could do the required testing meant that the first medical cannabis sale wasn’t made until August 8, 2017, on Maui. This article about the first anniversary of that opening is an interesting read, as is the February 2017 Update (PDF newsletter) published by the Department of Health in the News & Updates section of its Medical Cannabis Dispensary Program website. So, how do the dispensaries attract the tens of thousands of people on these islands who have been certified by a physician or APRN licensed to do that certifying by the state and with whom the patient has “a bona fide relationship”? One way some of the dispensaries attract customers is to offer a one-on-one patient education service in a reception area open to the public, or infosessions on- or off-site, applying the same age rule. Another way is to offer discounts, for example, to seniors – who make up over half of all 329 card-holders. Because there are so few dispensaries and so many registered patients, there is no need for cut-throat competitive practices. Most of them stress the sustainability and eco-friendliness of their grow operations. One dispensary, however, has potentially made itself extremely unpopular with certifying medical professionals by pushing for the state to extend the validity of a 329 card from one year to three. Unless they can manage to persuade their patients to come in for a yearly check-up and review of their medications, the medicos stand to lose a huge amount of business if such a change is approved by the state. It is at the level of certifying doctors and APRNs that the greatest competition exists. The DOH website does not have a list of doctors and APRNs licensed to certify a patient as having a qualifying condition, but many of the dispensaries do list them. Digging around on websites I found about 50 of them. Some don’t list their address, email or phone number, relying on the contact form on their clinic’s website to filter enquiries. A good measure of creativity has to be brought to bear, given the fact that some islands – like Moloka‘i – do not have any certifying medical professionals. Doctor420, whose main practice is on the Big Island, regularly schedules visits to other islands to meet with new patients and re-register others. However, such activity is likely unpopular with other clinics already in existence on other islands who consider it carpet-bagging. Another way to get to around the other-island factor, and because some of the qualifying conditions are extremely debilitating and limit the patient’s ability to travel even within island, is to offer telemedicine consultations via Skype or Facetime (after the state-mandated first visit is made in person), like Marghee’s Mobile Medical does on Kaua‘i. Despite its being legal in some states, medical cannabis is still associated in the minds of the general public with getting high on illegal drugs and its medical value is viewed with a lot of scepticism. That’s largely because it IS illegal under federal law, which also bans institutions like universities and the National Institutes of Health from conducting research on it. Major healthcare providers do not allow the members of their medical groups to become certifying physicians. Nor do health insurers include it in their coverage. 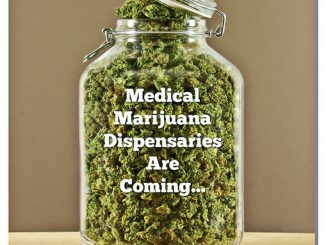 Because the federal definition that Schedule 1 drugs have no accepted medical use is belied by the fact that many states have deemed that cannabis DOES have a medical use, the argument could be made that the federal Department of Justice, including the Drug Enforcement Administration (DEA), has no right to go after the medical cannabis industry or those who use its products. Indeed, one certifying doctor in Hawai‘i makes that case on his website here. Along with regulating and licensing the industry and its users, Hawai‘i’s legislation also affords some state-level protections to patients, certifying medical professionals, dispensary owners and employees, and banking institutions that work with the industry. In light of the fact that the only state-approved testing laboratory for medical cannabis products is on O‘ahu, but there are licensed growers on the neighbor islands, the state also had to specifically allow dispensaries and individual patient growers and their caregivers to transport their product to the lab. Nevertheless, it is still a federal offence to transport it over federally controlled waters or through federal airspace. State prohibitions on the medical use of cannabis include banning its use on buses or any moving vehicle, in the workplace, on school grounds, at any public park, public beach, public recreation or youth center, and at any other place open to the public. It is also illegal in Hawai‘i to drive a motor vehicle when under the influence of medical cannabis, which is possibly another major reason people avoid its use altogether – measurable traces remain in a patient’s body for days afterwards, so a traffic stop involving a blood or breath test will result in prosecution, even if you’re not using it in the vehicle at that time. Two of the biggest concerns of anyone living in these islands are the cost of water and of electricity. The high prices are because we have a limited supply of the first, and because the second is often generated using fuels that have to shipped at great cost from the mainland. Hawai‘i has a plan to use only sustainable energy sources by 2045 (Moloka‘i is aiming to achieve that goal by 2020), but in the meantime dispensaries use a huge amount of both water and electricity in their grow operations because they are required by law to grow indoors. Along with the buzz comes a harsh economic reality. Nonetheless, according to Investopedia, global spending on legal cannabis is expected to grow from $9.5 billion in 2017 to $32 billion in 2022, with nearly $23.4 billion of that coming from the US. It is no wonder there is a plethora of articles in the media (including that one) about which related stocks to invest in! One of the immediate effects of New Zealand’s Misuse of Drugs (Medicinal Cannabis) Amendment Act 2018 was that the Kiwi start-up Helius Therapeutics leapt on the chance that a proposed amnesty by the government will allow unique local strains of cannabis (currently grown illegally) to be onboarded by licensed growers of medicinal cannabis. On their website, Helius has a contact page where “breeders” can upload their information in anticipation of the amnesty. If selected, their strains will result in an upfront Genetics Fee and the opportunity of ongoing royalties. Helius will cover the costs of analysing and characterising those strains in their own laboratory. The company is confident that there will be a global market for them, although it’s unclear if they will be exporting product to retailers or the seeds and plants to licensed growers in other countries. In reading about that, I am reminded about how the West discovered how to make silk, avoiding always having to import it at great cost from China – legend has it that some silkworms and plant cuttings were smuggled out of China in a traveller’s hair. And of the similar story of how Chinese gooseberries got to New Zealand, eventually creating the kiwifruit boom of the ’80s. At least if breeders have their plants patented, they will have some protection against not being rewarded for their efforts. And it also reminds me of the time I was hitchhiking in Taranaki and the good ole Kiwi bloke who gave me a ride told me how he’d made a fortune from patenting something that was used all around the world every day. A tiny thing, specific to one industry: the secure ID tag used by wool inspectors when they had graded the wool contained in bales destined for sale to manufacturers of carpet, apparel and other items. The inventor got only a tiny fraction of one cent for each one sold, but billions of them have sold over the years. Just as in any Gold Rush, when it was the providers of tents and work gear (Levi Strauss), the hoteliers and tool manufacturers who got rich, rather than those panning or digging for gold, so it will be in the Green Rush.